Tom Brady sneaks a touchdown past the Baltimore Ravens in 2012. With 13:33 remaining in the second quarter of a game on Nov. 10, 2002, the New England Patriots faced a 4th-and-1 from their own 39-yard line. Head coach Bill Belichick chose the traditional option and sent out the punt team. But there was one notable exception: Backup quarterback Damon Huard was included among the 11 men on the field. Huard, in his second year with New England, rarely played, and a quarterback isn’t a typical member of the punt team. Six plays later, a 57-yard field goal by Adam Vinatieri tied the score 3-3, and the Patriots went on to win 33-30. Huard’s quarterback sneak was a single moment in a long game. It didn’t ensure victory for the Patriots, nor did the Chicago Bears’ obliviousness on that fourth down doom them to defeat. But it was emblematic of a hidden theme of the Patriots’ 16-year run of unprecedented success: No team sneaks more often nor more effectively than the Patriots. Since the start of the 2001 season, the Patriots lead the league in QB sneaks, running 0.52 every game, which translates to one roughly every other week.1 For comparison, Kansas City, which is last in the league, runs about two QB sneaks per season. Most teams attempt about three or four sneaks in a season, with Jacksonville (0.5 per game or roughly eight per season) and Baltimore (roughly seven per season) the only other teams that approach New England’s frequency. During that period, the Patriots, led by Belichick and quarterback Tom Brady, have won 14 of 16 AFC East titles and have been to the Super Bowl seven times, including Sunday’s game against the Atlanta Falcons. The QB sneak is a remarkably efficient play, and an excellent way to extend a drive. Leaguewide, the conversion rate2 from 2001 to 2015 on 3rd-and-1 or 4th-and-1 plays that are not QB sneaks is 65 percent — on sneaks, that success rate jumps to 84 percent.3 And there’s a similar story when teams have 2 yards to gain, with sneaks 20 percentage points more successful (75 percent versus 55 percent) relative to other runs or passes. So the sneak is usually a good idea, relative to other play calls. But even compared to that higher baseline, some teams are much better at it than others. No NFL team other than the Patriots boasts a first-down success rate above 90 percent on sneaks. And this rate might actually conceal how good New England is: Twenty-one of its sneaks have come when needing 2 yards to go, also the most of any NFL team.4 With only 1 yard to go, the Pats have converted the first down on 105 of 113 tries (93 percent). This success begets more success. The 133 Patriots QB sneaks that Pro Football Reference shows were worth a cumulative 138 expected points, the equivalent of about 20 touchdowns.5 That’s a net benefit of about a point per QB sneak. Of course, most of the Patriots’ other offensive plays have also been net positives. But their 455 non-QB-sneak rush plays on the same downs and distances have been worth just 0.38 expected points per play. The Huard sneak is a prime example of the play’s effectiveness. According to PFR, it was New England’s fourth-most valuable offensive play that day, worth an estimated 2.6 points. A simple QB sneak that kept a drive going was worth a larger improvement in the Pats’ expected point total than Kevin Faulk’s 15-yard touchdown reception during the third quarter. The frequent success is due largely to two factors. The first: The simplest football play is a constant focus for the Patriots. Huard, who played for the Cincinnati Bengals, the Miami Dolphins, the Kansas City Chiefs, and the San Francisco 49ers during his 14-year career, said Belichick and the Patriots prioritized the QB sneak more than any other team. “Oh yeah,” he answered simply when asked, adding that while he can’t remember QB sneaks ever being the specific focus of a game plan, Brady, Belichick, the offensive coordinator and the offensive line talked about them on a weekly basis. They practice them, too, a fact that shocked coaches around the league. The second reason for success is that Brady excels in picking up the yard or two that’s needed for a first down. He’s not fast — notoriously running a pedestrian time at the 2000 NFL combine — but he’s large enough (6-foot-4, 225 pounds) to help push a pile, and he’s “not afraid to stick his face in there,” according to Huard. He’s also adept at reading defenses and determining their weaknesses. Huard saw this firsthand in practice and games: If Brady got to the line and thought he could get 3 or 4 inches, he would sneak. If not, if a massive noseguard and two linebackers were crowding the A-gap, making a sneak difficult, he’d run the play that was called. 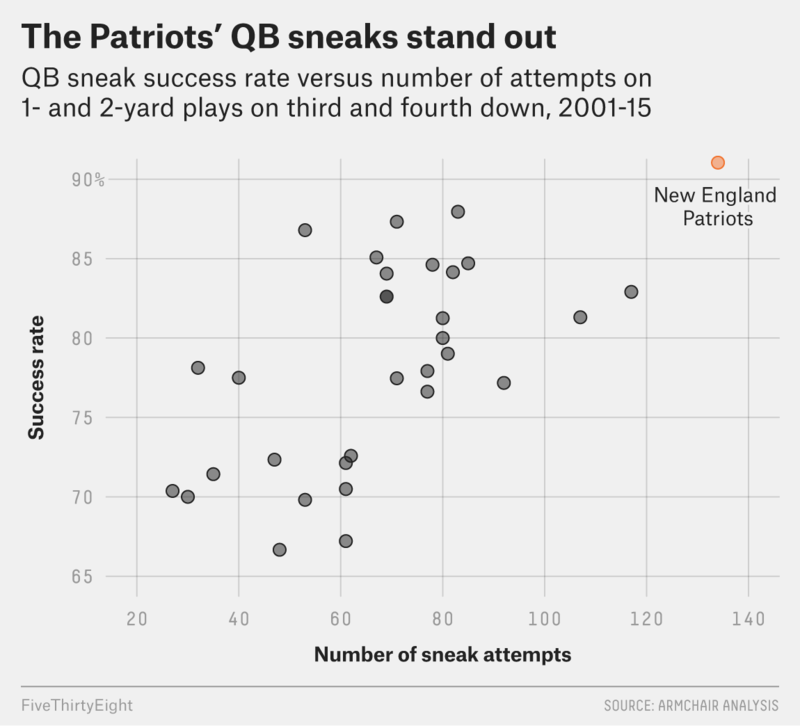 The QB sneak is an example of what the Patriots have done so well over the past 15 years. They find an advantage, and they exploit that advantage relentlessly. It’s so simple yet so effective. Belichick has been benefiting from using it for more than a decade and a half, putting his players into situations where they can succeed and positively affect the outcome. “I wasn’t exactly Randall Cunningham,” Huard said, laughing as he remembered the play from 2002. Brady isn’t, either, but it doesn’t matter. When it comes to the QB sneak, he’s more effective than Cunningham or any other quarterback. This success is a factor in the Patriots’ sustained success. We define a QB sneak as a middle run from a quarterback on third or fourth down and 1 or 2 yards to go. Shotgun plays are excluded. Including both first downs and touchdowns. Two-yarders make up 15 percent of the Pats’ sneaks, the 10th-highest proportion in the league. We used PFR’s play-finder tool to find extra QB sneaks from the Patriots, summing the expected points added on each. As an example, the aforementioned Huard sneak added 2.58 expected points.